I’m a sucker for disco balls. There, I said it. If anywhere or anything includes a mirror ball, I’m immediately a fan. I’m like a moth to a shimmering, glittering flame. But beyond my lizard brain fixation with shiny objects, disco balls can be harnessed as a complex symbol–a metaphor for community, excess, escapism, utopia, self-fashioned identity and even, safety in nightlife. Or conversely, disco balls, as Phoenix Lindsey-Hall shows in her current installation Never Stop Dancing at Victori + Mo, can stand in as representations of violent loss, mourning, memory and witnessing. Yeah, move over Susan Sontag, the disco ball can be a metaphor too. Approaching its 56 Bogart Street space, Victori + Mo’s open doors exude a rich, ominous darkness, which is a marked contrast from the other brightly lit white-walled gallery spaces in the building. Walking into the gallery feels like surrendering to the abyss. Covered with a cloak of deep black paint, Lindsey-Hall’s installation plunges viewers into darkness until they turn the corner. There, forty-nine sculptural disco balls hang at various lengths from the gallery’s ceiling. Several eye-searingly bright lights shine onto the mirror balls. 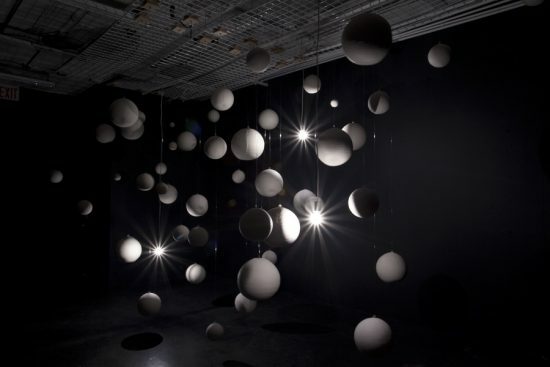 But rather than reflecting and scattering the light like in a club, these disco balls, made out of white porcelain, absorb the light, casting shadows across the space. It’s pretty eerie. The number of disco balls is not a coincidence. The forty-nine sculptures represent the victims of the shootings at Pulse nightclub in Orlando this past June. To be honest, Never Stop Dancing, to me, served as a reminder of the shootings. In the wake of the unending barrage of waking nightmares in 2016, the Pulse shootings seemed so very far away in my memory. But, this story should not go buried under Donald Trump’s tweets. Overall, the installation is a somber portrait of loss–not only the loss of individuals, but the loss of the safe space of gay bars and clubs. Exploring hate crimes through conceptual sculpture is not new for Lindsey-Hall. In previous installations, she reconstructed the fence where Matthew Shepard was killed in porcelain, as well as cast objects used as weapons such as hammers, baseball bats or beer bottles. But, her use of the disco ball as a minimalistic sculpture seems to be new territory for the artist. Rather than delving into the material culture of hate crimes against LGBTQ individuals, Lindsey-Hall, instead, employs the disco ball as a multifaceted and multilayered metaphor, symbolizing, at once, the freedom of gay bars and clubs and its traumatic shattering by the events at Pulse. Walking around the installation, the disco ball sculptures portray an uncanny physicality. As a whole, the installation resembles a solar system, a strange universe of queer stars. But, on closer inspection, each disco ball, by standing in for the dead, depicts the duel delicacy and strength of the body through the clay material. Even more significant, the porcelain covers the normally reflective mirrors covering the ball. Rather than celebratory objects, these disco balls are muted, still and somewhat dull. They’ve become lifeless. “A mirror ball–the size of which was magnified by the smallness of the room–both reflected and shaped the music on the dance floor. At the start of the party the sphere would be static as it waited for the gathered night crawlers to forget about the outside world and acclimatize to their new habitat. Then, as the mood became more focused, I would begin to hesitatingly rotate and gather momentum until, when the party hit full flow, it would switch into autopilot, triggering shrieks of excitement as it sent out its crisp, bright, laser-like beams into the otherwise dark environment. ‘At some point I would just let the mirror ball spin,’ says Mancuso. “But I would also slow it down if we were about to go into another phase. The mirror ball would always reflect the energy of the room.’” (26). More than just feeding off the movements and emotions of the dancers, the mirror ball somehow personified the communal environment of clubs. “That energy was never individualistic,” writes Lawrence, “Rather, it was social, and contained the possibility of collective politics” (27). Similarly, Sylvia Lavin writes in her Kissing Architecture, “..disco balls do not merely reflect light; by now they have become the source of a peculiarly collective special effect. Indeed, disco balls have catalyzed an entirely new notion of the social sphere, creating a flux of heterogeneous people, shaping them into tightly knit and mobile masses that dissipate and reemerge with quixotic regularity. Disco balls describe neither a public nor a mob but a provisional social ecology” (104). This social ecology becomes particularly important when talking about queer communities. Queer bars and clubs are often essential environments for people to experiment and try on different identities, personalities, fashions and/or performances of gender, sexuality, personae, etc. This critical importance of nightlife can often be overlooked in New York or other larger cities where specifically gay or lesbian bars or clubs are disappearing or becoming anachronistic relics, understood more through the lens of nostalgia than survival. Not that gay bars/clubs don’t matter here. They do. But there’s no question that their popularity and life-or-death necessity has dwindled in the big cities. But in smaller, particularly rural, areas, the gay bar still stands as a beacon of collectivity, queer community and even, momentary utopia in juxtaposition to the phobic world outside. I mean, there’s a reason the Baton Rouge gay bar George’s Place where Marion and I stopped for a drink had a metal door. And as Lawrence and Lavin show, the disco ball becomes a symbolic part of that space, creating the hallucinatory image of these huddled masses of people moving as one on the dance floor. This is what makes the juxtaposition of that queer world under the light of the disco ball and the silent, muted installation in Victori + Mo such a fitting memorial to Pulse. Sylvia Lavin describes in Kissing Architecture, “a disco ball that cannot spin seen during the day is a forlorn sight” (104). Likewise, with no music or throbbing beat, Lindsey-Hall’s disco balls have been rendered mute, useless and, quite frankly, dead. 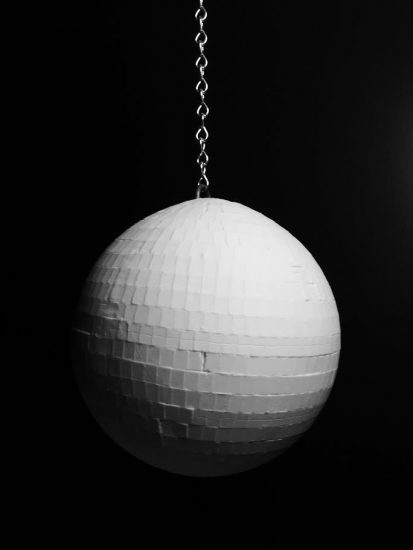 Her porcelain disco balls, like the 49 victims of the Pulse shootings, are physical representations of loss and the remaining memory of the safe space of nightlife. For many of us after the shootings, the disruption of nightlife’s imagined safety was as much of a trauma as the violence. In her OUT Magazine interview, Lindsey-Hall said, “Understanding the role of the nightclub is essential to examining the complicated horrors of the Orlando shooting, where a safe space was upended as mass murder site. 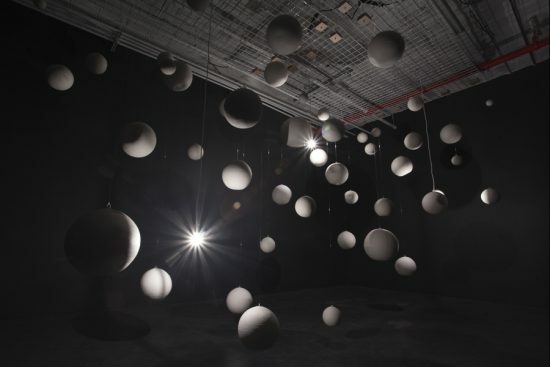 And all the while, the disco balls hung from above, slowly spinning and reflecting the scene, bearing witness to the horror of it all.” With this quote, the Brooklyn-based artist reveals the other–perhaps more haunting–metaphor represented by these disco balls–the disco ball as witness. On one wall behind the Never Stop Dancing installation, a poem is emblazoned on the wall in white text. 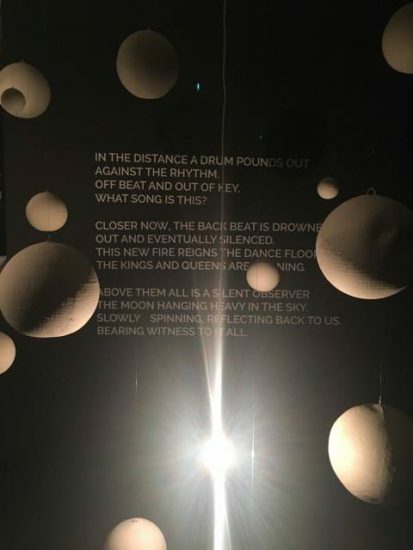 Unsettlingly but lyrically describing the shots ringing out as “a drum pounds out/Against the rhythm/ Off beat and out of key/What song is this?” while “The kings and queens are running,” the poem sets the terrifying scene in Pulse. It’s quite a horrifying image–the disco ball still spinning while reflecting a bloody massacre. But, beyond the carnage, the mirror ball also stands in as a silent observer, a witness, an accuser and potentially, a protector. While it spins during the tragedy, it also will spin again, as will other dancers. Like the title of her exhibition indicates, though these mirror balls have been extinguished, we will never stop dancing. Tags: disco ball, gay bars, gay clubs, Kissing Architecture, Love Saves The Day: A History of American Dance Culture 1970-1979, Never Stop Dancing, nightlife, Phoenix Lindsey-Hall, queer nightlife, Susan Sontag, Sylvia Lavin, Tim Lawrence, Victori + Mo. Bookmark the permalink.